JessTrev with a bit of reverence for those incredible, edible orbs. So, I am a huge eater of the scramblers. Or over-easies, poached Benedicts or Florentines, deviled ovals begging to be slurped up in one bite. Oh, baby, I love me some eggs. Aaaand, I'm lucky enough to live near enough to the drop site for Polyface Farms. So when a friend got pregnant? My first thought was, "Hell, yeah! I need to send that woman some Eggmobile goodness." I'm sure y'all can empathize, cause life is busy, and I didn't get around to wrapping them up with a cute little card. So this tribute will have to suffice. When I'm pregnant, I am many things. Ravenously hungry, a hair's breadth from retching agony, filled with fear and loathing of the horse-pills known as prenatal hair-shirt vitamins, and a-craving of the comfort food. For me? That means a lot of scrambled eggs on toast. So, without any clever invocation of obvious fertility symbols, I'll just say that a dozen of the best eggs I've ever tasted in my life seemed to be in order. Others have mused about farm-fresh eggs. I won't say more, except to say that they're right. These golden yolks? Are without compare. What's your favorite way to acknowledge a much-wanted spark of life in a friend? Heather - yeah, aren't those #s amazing? I'll bet you are right about veggies, too - especially for varieties that haven't been bred to bounce around a truck for days without bruising. If you could somehow get vitamin c into an egg, I would say you could quite possibly exist on nothing else... Just kidding. But, eggs are such an inexpensive way to feed yourself and your family a healthy, nutritious meal! I too have heard similar numbers for fruits and vegetables. The industrial agricultural food we are consuming is really missing out in terms of vitamins and minerals. The numbers you cite show how stark the difference is. 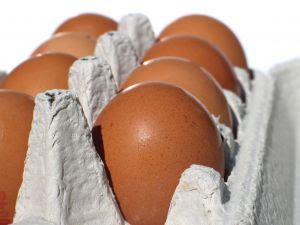 We lurve eggs and pack our own free-range eggs at our local co-op. We go through 3-4 dozen a week! Wow! Wish I had known about that when I was pregnant! Prenatal vitamins always made my morning sickness worse! Man I'm a huge fan of everything here. Locally grown produce is for sure the best because there's not all those preservatives that have to be put on them to make the two week trip from another continent. And they're healthier when they're freshly picked. I wish we could have our own eggs from our own chickens, but they've banned that in the city here.